It's tough for political and public figures to transcend their roles when they speak. After all, it's their position, most often, that puts them behind the microphone in the first place. And when an icon like Maya Angelou dies, the roster of speakers at the memorial service reads like a People magazine table of contents: Oprah. Former President Bill Clinton. Actress Cicely Tyson. 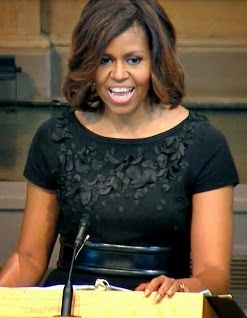 But First Lady Michelle Obama's remarks, intensely personal in nature, only touched on her husband and her position. Widely praised, this speech -- but for a few critical phrases -- might have been given by any black woman who'd grown up with Angelou's words ringing in her ears. The first time I read “Phenomenal Woman” I was struck by how she celebrated black women’s beauty like no one had ever dared to before. Our curves, our stride, our strength, our grace. Her words were clever, and sassy. They were powerful and sexual and boastful. And in that one singular poem, Maya Angelou spoke to the essence of black women but she also graced us with an anthem for all women, a call for all of us to embrace our God-given beauty. Don't overquote the deceased's most famous lines: One risk when an author dies is that every eulogy will sound like a Bartlett's Quotations, dense-packed with famous lines. Here, Mrs. Obama quotes Angelou just once, a restraint that lets the speech touch on more important connections in real life. There's also one clever allusion--"I do remember exactly how she made me feel"--to one of Angelou's most loved quotes, a good piece of advice for speakers: "I've learned that people will forget what you said, people will forget what you did, but people will never forget how you made them feel.” The allusion got just as much reaction as the full quote would have done, and advanced the story faster. Do share a private moment between yourself and the deceased: Like any speech, the audience isn't hoping you'll do a thorough review of the deceased's life, but that you'll share some private moments no one else witnessed. The story on stage with Angelou meets that bar for unique content, telling us about the subject of the eulogy and about the speaker, all at the same time. Use your voice to create emotion and emphasis: In addition to merely elliptical references to her position, it's her voice that helps this eulogy sound like a deeply personal tribute rather than the pronouncements of a First Lady. Michelle Obama excels at this, using pacing and cadence and vocal variety to make her words sound realistic, human, approachable and emotional. You see and hear her as an individual here, and that allows the focus to be on Angelou--as it should be. Watching @MichelleObama speak at funeral of @DrMayaAngelou & reminded that she is the real orator in the Obama family. I agree with NPR host Scott Simon. You can read a transcript of the speech here and watch the video below--listen for her inflections and emphases in this delivery. What do you think of this famous speech?